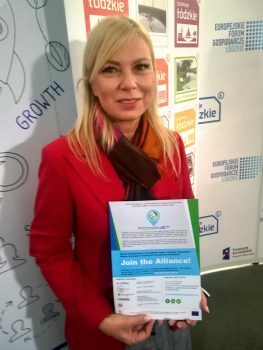 Mrs Elżbieta Bieńkowska, European Commissioner for Internal Market, Industry, Entrepreneurship and SMEs, has been acquainted with the ideas of FoodNet project during the meeting with business entities and local authorities in Marshall Office of Łódź Region, Poland. Mrs Bieńkowska came to Łódź city receiving invitation of Mr Witold Stępień, Marshall of Łódź, to recognize the current situation of local companies exporting products to Chinese market. It is one of most difficult market to uptake, and, as Mrs Bieńkowska said, Polish and – in wider scope – European enterprises need support of EC authorities to overcome barriers and bottlenecks on the way to Chinese customers. Since partners of FoodNet, according to results of survey conducted within the frame of the project, designed China as one of three most crucial markets in the area of interest of project’ stakeholders, for logistic and food companies it seems to be significant to co-operate with supporting institutions to facilitate smoother access to Chinese market. Mrs Elżbieta Bieńkowska expressed the sympathy to the idea of meta-clustering, confirming her positive opinion about creating international alliances of clusters in order to increase the competitiveness of their SME’s.